To say I am ecstatic with the May Birchbox* would be unjust. 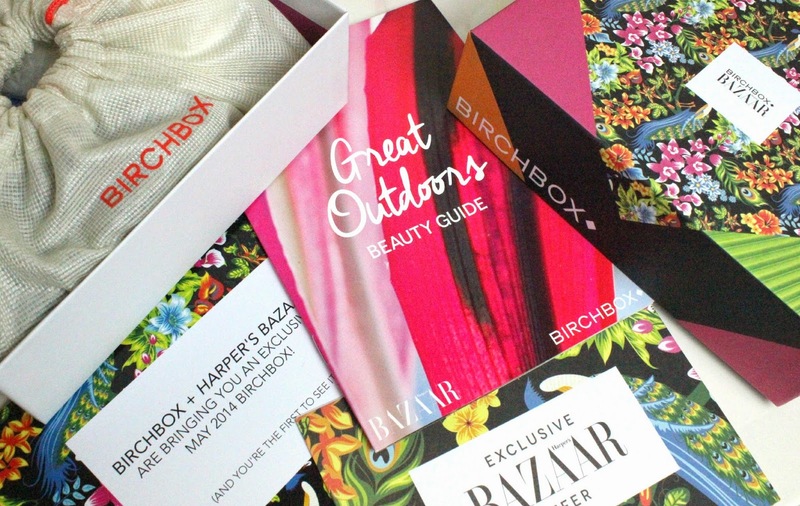 As soon as I saw the May box, I was besotted; a beautiful, vibrant floral design dons the May Birchbox, a collaboration with Harper's Bazaar. I thought the Lulu Guinness collaboration box was stunning, but this is just beautiful! I'm really liking the themed boxes and I'm excited to see what the next Birchbox collaboration will be! But enough about the box, let's get straight into the contents - because it's my favourite ever Birchbox, and I am smitten! The first thing that caught my eye was from one of my holy grail skincare brands; a travel size Liz Earle Cleanse & Polish Hot Cloth Cleanser and a Liz Earle Muslin Cloth (Birchbox, from £13.25) As someone who has hailed this coveted cleanser as a favourite and one of the best, it was lovely to see a travel size in the box. Liz Earle is one of the newest brands to join the Birchbox eShop, so be sure to check out the full range! Next up I spotted a box, which itself wasn't inviting nor pretty, a plain black and white box. Yet inside the box was the most beautiful bright orange polish, that I am now completely and utterly addicted to! 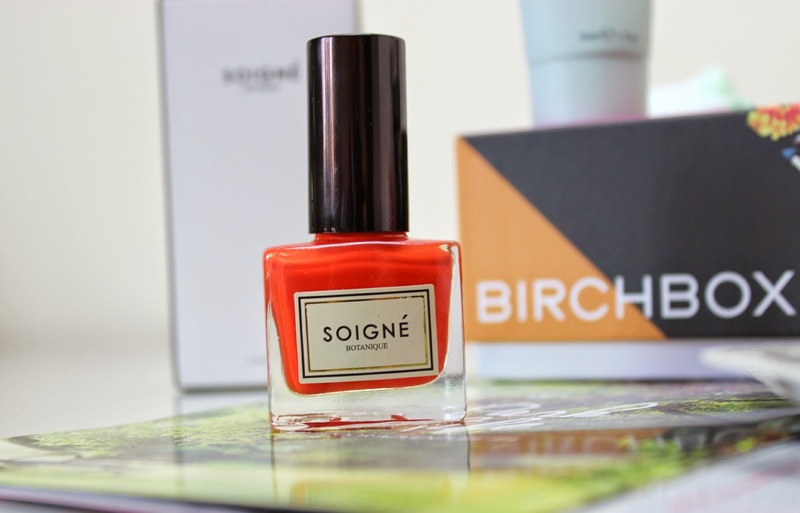 I received a Soigne Nail Lacquer in Persimmon (Birchbox, £11), which I am just so impressed with! This could possibly be the start of a new favourite nail polish brand. The beautiful Persimmon applied streak-free effortlessly, with a true opaque colour in just two coats and after five days so far, not a single chip! I was really happy, as ever when they feature in a beauty box, to see a sample of Aromatherapy Associates Relax Light Bath & Shower Oil (Birchbox, £39) For me, Aromatherapy Associates is a brand like no other for true relaxation and incredible oils. I have so many of the lovely little mini bottles now, and each gets put to good use. Relax Light is perfect for a night-time bath and unwind, just lovely. A brand I'm getting used to seeing in beauty boxes, there was a fab travel size Benefit They're Real! Mascara (Birchbox, £19.50) in the May box. For me this was perfect timing, as I had just finished my full size They're Real! and it's a fab mascara that I love, but it'd be great to see something other than a mascara or primer from Benefit if they feature in a future box. The last beauty product in the May box is a Philip Kingsley One More Day Dry Shampoo (Birchbox, £13.50), another product I was really happy with as it's my favourite dry shampoo! Always good to have a back-up... To add to the glorious array of beauty products in the May box, there's a lifestyle extra in this month's box; Imedeen Derma One (Birchbox, £37.99) which work to tackle anti-ageing from the inside with Zinc and Vitamin C packed supplements; key to skin clarity, elasticity and overall smoothness. Excited to see how these fair! 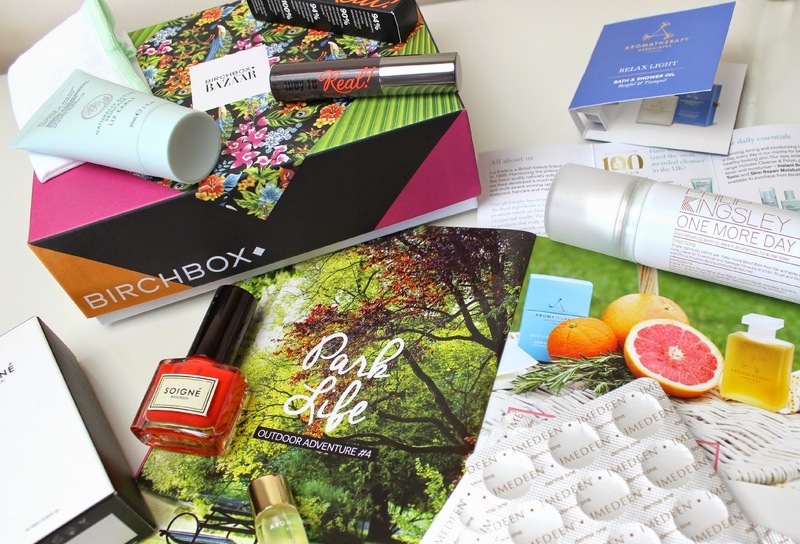 So what do you think to the May Birchbox?! Are you as impressed with the contents as me? Let me know if you got a different contents, or if this has spurred you on to subscribe to Birchbox! The US version of Birchbox is never as lovely looking as the British version, there are always themes but the boxes are always the same and the products usually have nothing to do with the theme at all, All these products are so lovely! Love the exterior and interior! I literally JUST subscribed to BirchBox this month and received my box yesterday, I haven't even had time to blog about it yet but the goodies look amazing, I'm so excited to try the Liz Earle cleanser!!! I subscribed to Glossybox before, for almost a year and it never gave me anything good, so I am so impressed by the Birchbox!! Hope it's always this good!! This box looks amazing - I really want to try the Liz Earle cleanser as I've heard so much. Birchbox seem to be getting more consistent now - I was put off subscribing before as I thought some of the boxes really let them down!